St. Margaret's Garden Safari has been a popular biennial event for the last 14 years. It all started as a simple village fund-raiser but is now a major event in every Kent gardener's diary. St. Margaret's is located near to Dover in Kent. It is made up of two areas, the old village center (St. Margaret's-at-Cliffe) grouped round a 12th century village church and St. Margaret's Bay fronting onto the coastline. Although the village only has a small population of about 2,500 residents it has had a very interesting, rich and unusual history and in the past been home to various famous figures such as Noel Coward, Ian Fleming and Henry Royce. Close to the village, the lighthouse on the South Foreland is now owned and opened to the public by the National Trust. It was the first in the world to be lit by electricity and Marconi carried out early wireless experiments there. The first cross channel telephone cable was laid from St. Margaret's Bay to France in 1891 and the bay has also seen the start of many cross channel swims. Henry Royce developed Rolls-Royce's first aero engine in 1915 whilst living in the village and the last bomb to land on England during the First World War fell on the village in May 1918. A large number of gardens will be open to the public over the Garden Safari weekend. 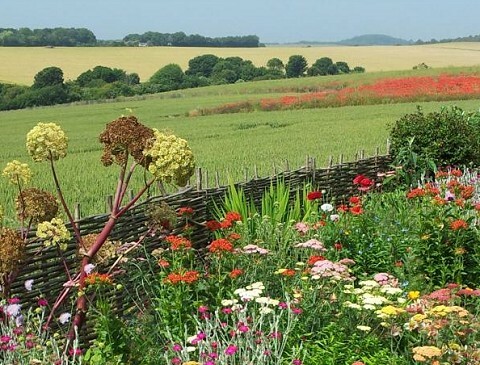 Colourful flower gardens, beautiful and spectacular sea views across the channel to France, combined with sales of lunches, afternoon teas, plant sales, various artworks and other in-garden attractions will make the 2019 Garden Safari a very enjoyable event for the whole family. There will also be Pilgrim's Hospice merchandise and raffle tickets for sale with many valuable prizes donated by local businesses to be won. All proceeds go to Pilgrims Hospices - Hospice Care in east Kent. Early Bird tickets £5.00 per adult. After 22nd June 2019: £8.00 per adult. Accompanied 16 years and under free. Tickets cover both days. At the event or at advance sales outlets. Locations of advance sales outlets can be obtained through the organiser contacts detailed below. Approximately 27 gardens will be open, but the total may vary from day to day - please contact the organisers if you need exact numbers.